Gigantic Easter sale may cover your needs this week. 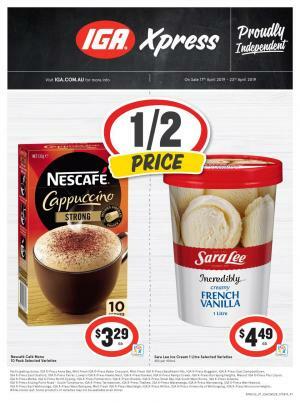 Check out the half prices on Cornetto, Red Tulip hunting eggs crate, and Sorbent on the first page. Buy from the variety of breads on pg 3. Wonder White bread of 700g pack is gonna cost $3.40 only. IGA Catalogue is a nice source to find a good price on dairy products including cheese. Fill your fridge with quick foods which are purchasable for much lower prices at IGA stores this week. Buy Bega tasty cheese 1kg for only $8.99! Save $2.20 on that product. Never feel like you need to spend much higher than these. 3-day sale will assist you in finding a really nice price of the fresh produce. Strawberries will cost 2/$5 for 250g punnet. Multi-buy deals might be profitable for you. If you want to shop for household supplies, there are great deals on that part of the catalogue. Handee ultra paper towel 6 pack will cost only $3.59. Buy snacks at IGA. Cadbury favourites of the 540g pack will make a great Easter treat. Pay only $7.99 for that pack. Follow our Facebook page to track the deals from the future IGA Catalogues. 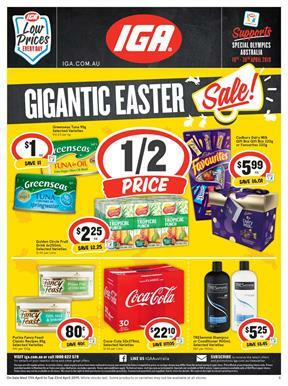 IGA Catalogue discounts are special for Easter. The half-price sale covers nice offers on the first page. You can stock up some ice cream buying Streets Magnum tub of 440mL for only $4.24 which is the half price. Tasty, juicy, and fresh foods of IGA are also a great part. Visit pg 2 to see Gold sweet potatoes priced at $2.50/kg. If you like to eat some bread with your meal or toast them in breakfast, low prices everyday range can help you save more. Wonder White bread of 700g pack is $3.40 at IGA stores next week. Fill your fridge with delicious quick foods and stuff. Grated cheese of Bega will cost $6.50. IGA has also offers of the market day. Buy brushed potatoes for a $3/5kg pack. Some products have prices that are better than half. For example, Uncle Tobys Muesli bars or roll-ups will cost $1.80 which is $2.20 cheaper than its regular price. See some household supplies, beverage, snacks, and more grocery in the rest of the IGA Catalogue. You can always check this page or follow us on the Facebook page for the news and updates. Also, get the newsletter about the future catalogues via a subscription which is free. Easter candies are available on pg 10. Find Red Tulip, Lindt Gold Bunny, and more. IGA Catalogue is present with a lot of new half prices again. Peters Drumsticks, Mrs Mac's pies, Coke, and Allen's are 4 products that are on sale by half-price deals. Also, find great products of bakery and fresh produce. Low prices of bread variety, finest of the meat, carrots, iceberg lettuce, Valencia oranges, Primo Salami, and more are in the fresh range of IGA Catalogue. Renew your stocks of the pantry with the prices of Balducci extra virgin olive oil, Heinz Spaghetti, Continental chicken or creamy chicken from IGA's sale this week. Half-price deals and mix and match sales are possibly what can draw your attention in the pantry-fridge food of IGA. Visit pg 8-9 to see Yoplait yoghurt, McCain beef batter chips, Birds Eye products, and more items of fridge food. Have your breakfasts with Uncle Tobys nutritional plus cereal. Pay only $5 for each. Go to pg 11 to see non-food part of the IGA Catalogue. Follow our Facebook page. We share these deals and posts there. You can also subscribe to get emails.